One of Dormen’s clients in North Dorset, the Metal Design Company (Dorset) Ltd has gained the prestigious ISO 9001 Quality Standard. 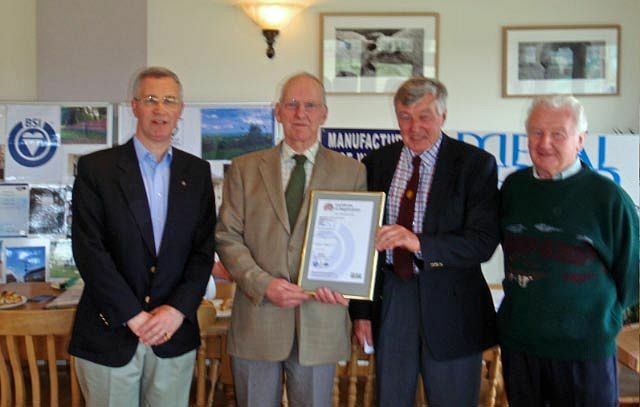 At a recent ceremony in East Stour, a representative of the British Standards Institution presented Ed Highnam, Managing Director of Metal Design, with the official certificate. Trevor Dutton, Metal Design’s mentor, said: “This is a huge and very well deserved achievement for Ed and his team. It reflects the way in which they have raised their game as a business and I wish them every success for the future”. The company manufactures a wide range of products including railings, staircases, balconies, gates etc., using steel or wrought iron. Further details and pictures can be found at www.metal-design.co.uk.